Welcome to Experiencia Surf Camp. Their new surf camp building is just a few steps from one of the best places to surf in Mexico, La Punta of Zicatela. Enjoy comfort, cleanliness, and safety, and relax after surfing with sunset yoga classes right at the surf camp every other day. Travel, surf, and come with Experiencia Surf Camp to surf trips to the best hidden destinations and surf spots of Pacific Mexico. You will be provided 14 nights of accommodation in this yoga and surf camp. Stay with Experiencia Surf Camp right at the surf camp and get the full surfing experience. Private, shared, and dorm rooms are available. The new building is just a few steps from one of the best places to surf in Mexico, La Punta of Zicatela. Expect safety, cleanliness, and comfort. The surf school will serve as your home, and it will inspire you to enjoy this world in the water and outside. The rooms have two beds, so normally one to two persons stay in one room. Private rooms are available upon request. The school residence and the surf camp have free Wi-Fi connection both in the rooms and common areas. Linens, bath, and hand towels are provided and changed once a week. 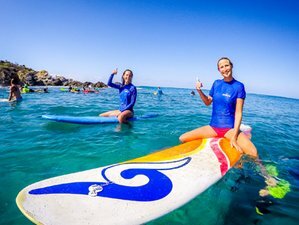 Join daily surf lessons in the morning and in the afternoon, with professional instructors and good equipment, from beginners to intermediate and advanced. All classes are two hours, it includes theory, warm-up, and practice in the water. Experiencia Surf Camp guarantees good surf equipment and experienced surf instructors for all students. The surf class lasts for two hours, warm-up (five to ten minutes), surfing and warm-down (five to ten minutes). Boards, lycras, and instructors are included. Usually, one instructor teaches no more than two students in one lesson. The morning class is from 8:00 a.m. to 10:00 a.m. and the afternoon class is from 3:30 p.m. to 5:30 p.m.
Usually, it takes about five classes to obtain the necessary level to go on your own, so it is strongly recommended that for the first several classes, you go in the water with the instructor. There will be six classes of yoga during these two weeks. Yoga classes usually take place every Tuesday, Wednesday, Thursday, and Sunday from 6 to 7 or 7:30 p.m. The yoga style is Hatha yoga, intended more for beginners and aiming to relax after an intense exploration or surf day. This yoga and surf camp will be held at Puerto Escondido in Oaxaca, Mexico. In addition to Spanish courses, the school organizes cultural and athletic activities for the students. The weekly program provides a great opportunity to learn more about Mexican culture and, above all, take a little break from studying. These workshops are designed to help students understand how to help and care for the planet and its people. Your help is directed to programs for children without parents or with mental or physical disabilities, indigenous communities, or ecological projects. You can tour marine turtle hatcheries, observe migrating birds, visit mangrove swamps and coffee plantations, all in an atmosphere of security, comfort, and tranquility. Every Saturday, the school organizes an excursion of five to seven hours duration to places within one to two hours of driving distance. These trips might include archaeological sites, the beaches of Huatulco, Mazunte, or Xipolite, the National Park of the Lagoons of Chacahua, the coastal village and mangrove swamp of La Ventanilla, observing wildlife, visiting coffee plantations, or indigenous communities. Expeditions differ from excursions in that their main purpose is to share ideas and work together to conserve wildlife. This might include night trips to a beach to prevent the stealing of tortoise eggs, cleaning beaches, rivers, or mangrove swamps; providing environmental education for people with limited resources, or collecting and managing materials dangerous to the environment. Some weekends, the school organizes excursions of three days and two nights to places, such as Oaxaca City, Acapulco, Playa Ventura, Mexico City, San José del Pacífico, Salina Cruz, or San Cristobal de las Casas. Please book your flight to arrive at Puerto Escondido Airport (PXM). Transfer from and to the airport is included. Experiencia Puerto Escondido will pick you up from the airport. Airport: Puerto Escondido International Airport Airport transfer included: Puerto Escondido International Airport No additional charges. You can request this in the next step. Services are not transferable to another person, except in cases when the notice is done more than 45 days prior to arrival date.